Cheltenham boss Gary Johnson can fully understand why some supporters have been calling for his head after a disappointing run of results in recent weeks. The Robins have lost four of their last seven matches as they now sit 16th in the table, but are already a healthy 12 points above the drop zone. However, Cheltenham were booed off after their 2-0 home defeat by Wycombe Wanderers last Saturday with some fans wanting a change at the helm, as Johnson told the club’s official website: “Of course I can understand the reaction against Wycombe. “Football is football and if you win everything is good, which we had against Port Vale, but if you are losing people are getting disappointed and frustrated, so I understand that. Their one win during that time came in a superb 5-1 drubbing of Port Vale, but two draws, means it is a rather disappointing tally of five points out of 21 recently. Away form has been picked up slightly of late as after only winning once on their travels before mid-December, the Robins triumphed 2-0 at Barnet and then a thumping 4-1 success over Colchester recently. They only lost by the odd goal at both Mansfield and Lincoln, while gaining a 1-1 draw at Grimsby as well, meaning they are no pushovers away from the confines of Whaddon Road. Johnson did have a busy transfer window, particularly in the loan market, bringing in the likes of Joe Rodon from Swansea, plus Emmanuel Onariase from Rotherham too. Brentford’s Ilias Chatzitheodoridis also signed, as did Jake Andrews from Bristol City and Elijah Adebayo was borrowed from Fulham too, meaning that the club now have seven on loan, with only five able to play on a match day. On stopping the Hatters from adding to their 72 league goals this season, with Town one away from racking up a half century at home this weekend, Johnson said: “They create lots of opportunities and they have players who can finish those opportunities and I have been saying since early on they are a League One side in waiting and that’s what they are. “They have proved that many times this season and they are a dangerous team, especially at home. “I am looking forward to going there and I am sure the bookies don’t have us a favourites, so it will be interesting to see if we can cause them a problem. “They interchange and they are a good side for interchanging their positions when they need to. When they come forward they commit themselves to come forward. “They do it very well, with quality players who can find the right ball at the right time and that’s sometimes the difference between the top and bottom of the league and the first division and the second division. “We have to make sure we are up for it, battle as best we can and these teams like a bit of room to do their stuff. Team news: The Hatters are almost at full strength for the clash with Danny Hylton, Alan McCormack and Scott Cuthbert back in contention, leaving only Elliot Lee (shoulder) and Dan Potts (suspended) as the only absentees. Like Luton, Robins boss Gary Johnson has a nearly fully fit squad to select from, with just Jordan Cranston and Jordon Forster sidelined due to long-term injuries. Top goalscorer: Hatters – Danny Hylton (17). Robins – Mohamed Eisa (17). Man in the middle: Mark Heywood - has taken 24 games this season, with a fair few in League One, showing 96 yellows and three reds, with one Luton match, the 3-1 home win over Newport back in September. Had Hatters twice last season, sending off Johnny Mullins in the 1-1 draw at Wycombe and also dismissed Michael Raynes in the 1-1 draw against Carlisle at Kenilworth Road. Referees assistants are Stephen Finch and Daniel Cook with the fourth official Adrian Waters. In charge: Gary Johnson, started his career at Watford and had spells in Sweden and England, before beginning his managerial career at Newmarket Town in 1986. Headed to Cambridge where he had stints as reserve team boss and assistant in 1990, eventually managing the first team between 1993-1995. Jobs at Kettering and Watford followed, while he was named Latvia national boss in 1999, spending two years in charge. Returned to England and managed Yeovil (twice), Bristol City, Peterborough and Northampton, before being appointed Cheltenham boss in March 2015. Although the club dropped into the Conference, Johnson led them back to the Football League at the first attempt in the 2015-16 campaign and ensured they stayed up, finishing fourth bottom last term. 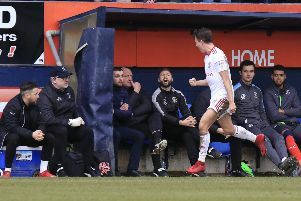 View from the opposition: Will Boyle, who scored a last-gasp leveller in the 2-2 draw earlier this campaign, told the official site: “Luton have scored 72 league goals which is outrageous, they have got goals from all over the pitch. “They have got front men who are prolific, which is vital. “They are flying and I can’t imagine many people outside of this building, apart from hopefully some of our fans, will expect us to go there and get a result. “You have got to go there and keep it tight. Hopefully get to half time and stay in the game. “They can be rampant and if they do open you up, and you are chasing the game, you can be vulnerable. “It’s important we go there and play too, show what we are about. Especially after last week when we had a disappointing performance. Friendly faces: Recent Luton addition Lloyd Jones went on loan to Cheltenham from Liverpool in January 2015, signed by former Town boss Paul Buckle. Played six times for the Robins including against the Hatters in a 1-1 draw at Whaddon Road. Midfielder Lawson D’Ath was at Cheltenham between October 2012 and January 2013, joining on loan from Reading. Scored on his debut against Exeter in a 3-0 win, but only played three times in total. Played for both: Stuart Fleetwood – 31-year-old striker joined Cheltenham on loan from Charlton in September 2008. Scored on his debut in a 2-2 draw against Stockport and also netted in a 4-3 win over Colchester, as he bagged two in seven games, before heading to Brighton on loan. From there, went to Exeter and Hereford until he was signed by Luton in August 2011, going on to score 27 goals in 88 matches. Since leaving Kenilworth Road, has played for Eastleigh, Forest Green Sutton, Weymouth, Bath, Merthyr and is now at Southern League Premier Division side Redditch United. Bagged 10 goals already, including four in a 7-1 win over Farnborough recently, while has returned to Cheltenham too, coaching the U13s. One to watch: Forward Mohamed Eisa has definitely found his shooting boots once more this season as he has powered to the top of the Robins’ scoring charts during his first season in the Football League. Started off with four in his first three matches and then replicated that stat in September to make it eight goals from his first 13 appearances. A barren spell of 10 games without hitting the net followed, before he notched in the 1-1 draw at Forest Green in November. That has led to another purple patch of sorts, notching seven times in his last 15 games including a hat-trick in the 5-1 win over Port Vale. We’ve got form: Hatters just about have the edge over Cheltenham at Kenilworth Road, with three wins, two defeats and one draw. Things had started well for the hosts, 2-1 winners in their first meeting back in 2001 thanks to goals from Paul Hughes and Carl Griffiths, following that up by a repeat victory in 2002, Chris Coyne and Andrew Fotiadis on target. A League One clash in December 2007 ended 1-1 as Sam Parkin netted for Town, while Town then lost 4-2 in the FA Cup back in December 2011, after an Aaron O’Connor double. Mark Cullen scored the only goal in a 1-0 win during the 2014-15 season, before last seasons’ disappointing reverse. Last time out: The Hatters were beaten 3-2 at home by Cheltenham in one of the low points at Kenilworth Road last season. The visitors went in front on five minutes after an awful error by debutant keeper Stuart Moore was pounced upon by William Boyle. Jack Barthram made it 2-0 on the half hour, while Isaac Vassell pulled one back four minutes before half time. Billy Waters added the third after an hour as although Liam Davis scored an own goal on 72 minutes, Town couldn’t draw level. Hatters: Stuart Moore, James Justin, Jack Senior, Scott Cuthbert, Glen Rea, Jonathan Smith (Olly Lee 46), Jordan Cook, Pelly-Ruddock Mpanzu, Luke Gambin (Jake Gray 70), Jack Marriott (Lawson D’Ath 61), Isaac Vassell. Subs not used: Craig King, Stephen O’Donnell, Alan Sheehan, Zane Banton.